← Impact of a low-carbohydrate, high-fat diet on gut microbiota. For overall health and well-being, fermented foods like sauerkraut and kefir are great. Especially when following a low carbohydrate diet which is generally low in the types of foods which feed the gut microbiome. For those with gastrointestinal problems, the gut microbiota is probably involved. Whether it is bacterial overgrowth or dysbiosis, gut bugs are usually the culprit. Treatment options vary widely, ranging from global extermination with vinegar & a low fibre diet (as per Jane Plain), or remodeling the microbiome with a prebiotic like galactooligosaccharides. Probiotics like bifidobacteria can help, too, if they’re administered with either prebiotics or fermented foods (they need something to nourish them in transit). Dark chocolate is also an excellent vessel. Resistant starch is another option, although the question remains as to whether or not this is compatible with a low carbohydrate diet. Resistant starch has been around for a while, and when I was in school it received about 10 minutes of attention during the fibre lecture. But Jimmy Moore and Richard Nikolay have been talking about it a lot lately so I decided to freshen up on the topic. In brief, it can be therapeutic for GI issues, but some studies have shown mixed effects on glucose & insulin metabolism. The former is virtually unarguable, but I found the latter interesting. And the impact of resistant starch on ketosis is included as well. Some studies are designed to determine the impact of including resistant starch with a meal on metabolic parameters (single-dose), others are chronic dosing studies designed to determine if resistant starch elicits lasting effects. The first study is the latter. The amount of “available carbohydrates” was controlled (27 grams). Type II resistant starch is found in things like raw potatoes or green bananas. Since it’s a crossover study, the elephant in the room must be acknowledged: 4 weeks of resistant starch induced insulin hypersecretion , which according to Barbara Corkey will cause insulin resistance and according to Robert Lustig will cause obesity. 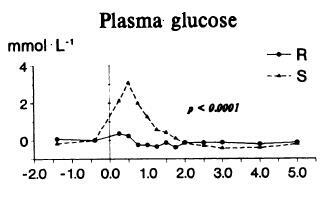 However, fasting glucose was modestly lower after 4 weeks of RS (5.0 vs 4.8 mM, p=0.049 <– just made it! ), so I don’t think this means resistant starch will cause IR or obesity… had to include this study because it is one of the very few crossover studies with chronic dosing. It’s also part of why I said: “mixed effects on glucose and insulin metabolism” in the intro. Breakfast was a regular bagel or one enriched in type II RS (Hi-maize 260); both had 50 grams of “available carbohydrates,” the RS bagel had ~30 grams RS. Lunch was a quarter of a Subway sandwich. More in agreement with known effects of fibre, RS modestly blunted the glycemic impact of the bagel at breakfast (statistically non-significant; note the huge error bars). 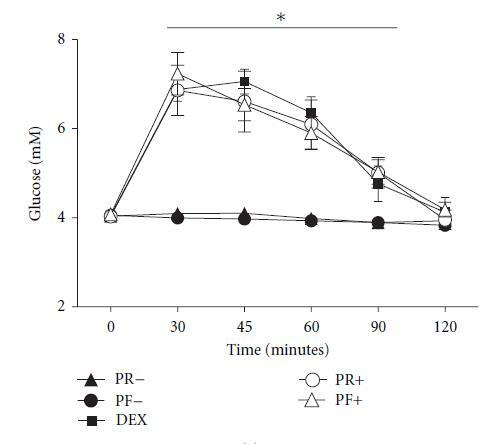 The reason we didn’t see this in the Bodinham study (above) is likely because those subjects received glucose alone, whereas in this study glucose was administered with RS. (also, wouldn’t recommend intravenous RS; that would completely defeat the purpose and probably kill you). To dispute the second option, Richard Nikolay directed me to this study, which shows that type II RS doesn’t impact blood glucose (Raben et al., 1994). They used 50 grams of potato starch , which provides ~27 grams of RS. 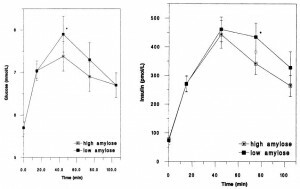 And another one courtesy of Richard, comparing ~60 grams of a resistant starch-enriched cornstarch (“high-amylose”) vs low-amylose cornstarch for 4 weeks, crossover (Noakes et al., 1996). At the end of each intervention, participants were subjected to a “meal tolerance test.” Disclaimer: this wasn’t a strong intervention; high amylose cornstarch is ~33% RS, so there wasn’t very much RS in their diets. In other words, the results of their meal-tolerance test probably weren’t affected by the 4 week diet. The “meal” was a muffin with 60 grams of carbohydrate, 33% of which was high or low-amylose cornstarch. So in the figures below, we’re looking at 60 grams of regular starch vs about 50 grams of regular starch + 10 grams of RS… and we see modestly lower glucose and insulin, which is likely due to: 1) known effect of fibre on glucose absorption; and 2) the fact that there was less slightly less “available carbohydrate” in the high-amylose cornstarch group. The last study on type II RS, courtesy of FTA commenter Tim: 50 grams of Hi-maize 260 (30 grams of RS + 20 grams of regular starch) vs 20 grams of regular starch for four weeks (Robertson et al., 2005). This is one of the better chronic RS dosing studies. 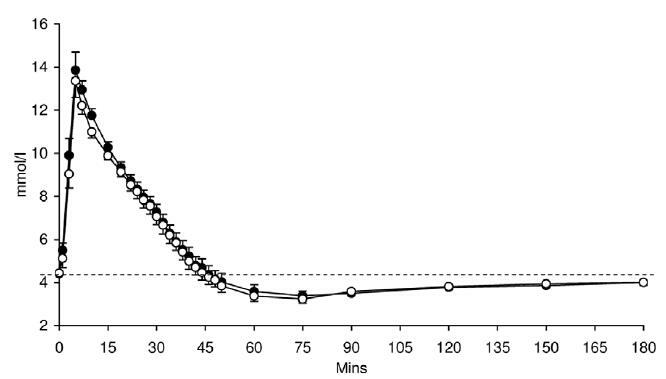 Insulin, 5 hour AUC, was significantly lower in RS group. No impact on blood glucose response, possibly because there was no RS in the test meal, but less insulin means improved glucose tolerance. This is also in contrast to Bodinham & [possibly] MacNeil. Oddly enough, the most statistically significant finding of the entire study was increased glucose uptake by adipose tissue (p=0.007) (?). However, they did perform a hyperinsulinemic-euglycemic clamp (the gold standard) which showed a 14% increase in insulin sensitivity (p=0.027), which may have been due to the modestly greater lean mass in the RS group <– that’s a good thing; this is a crossover study. Another disclaimer: statistics are the bane of my existence. I’m including “p-values” here because these are crossover studies. Moving on to type III RS, which is found, for example, in a cooked potato after it has cooled. 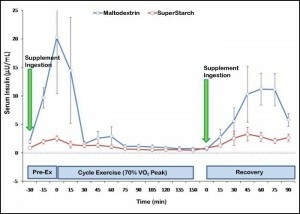 This study compared the addition of 60 grams of Novelose 330, a type III RS containing 25.4 grams of RS with a similar amount of starch coming from bran & complex carbohydrates. This was a 3-week long weight-loss study, where weight loss was achieved by a high protein low calorie diet. By the end of the intervention, participants lost ~5% of their body weight; >80% of it was fat mass, likely due to the relatively high level of dietary protein (~150 grams). The only other major finding was that weight loss reduced fasting insulin levels (duh), but this wasn’t affected by the addition of type III RS. Next on the docket is a pharmaceutical-grade type IV RS, which isn’t found anywhere in nature. This is a single-dose, 5-way crossover study. Participants were given either water or 50 grams of glucose along with 38 grams of one of two RS products. 38 grams yields approximately 30 grams of RS (and some moisture, etc.). So the RS + glucose groups were given ~80 grams of “carbohydrate,” 30 of it being RS. As expected, and in agreement with Raben (above), RS didn’t budge blood glucose levels. 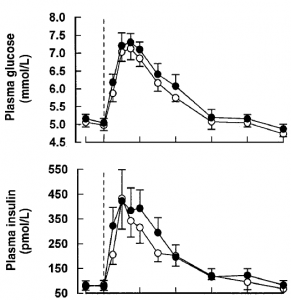 However, surprisingly, nor did it blunt the glycemic impact of 50 grams of glucose. Resistant starch products ingested alone don’t affect blood glucose because the digestible portion digests very slowly, leading to a very slow rate of glucose absorption (Raben & Haub). According to the studies discussed here (Bodinham, Noakes, & Lobley), the effects of RS on insulin sensitivity appear mixed, but this is likely due to differences in study design, subject populations, etc. 1st one: someone in low-moderate ketosis and weight-stable. Adding potato starch to the diet will probably reduce ketones because: 1) it’s providing glucose & calories to the body above and beyond what’s required for weight maintenance = they’re now in a positive energy balance, so the additional glucose & calories will blunt ketosis; and 2) some of the nondigestible portion will be metabolized into SCFAs, some of which will go to liver and be used as fuel, temporarily displacing fatty acids thus reducing ketogenesis. 2nd one: someone in deeper ketosis on a hypocaloric, weight-loss diet. Adding potato starch to the diet will probably have minimal impact on ketones because: 1) unless they’re chronically ingesting large doses, not enough glucose will accumulate to inhibit ketosis in the context of a hypocaloric diet. And 2) energy deficit is and carbohydrate restriction are two [more important] regulators of ketosis. If you’re on the weight loss phase of a ketogenic diet, than a couple tablespoons of potato starch won’t hinder your progress, and it’ll probably help your bowels. If you’re weight stable with low & variable ketones, and your goal is deep ketosis, then exercise caution. This entry was posted in Advanced nutrition, clamp, diet, fiber, Grains, insulin, Ketosis and tagged bifidobacteria, carbohydrates, diet, energy balance, fibre, grains, insulin, ketogenic, ketosis, microbiota, nutrition, prebiotics, protein. Bookmark the permalink.